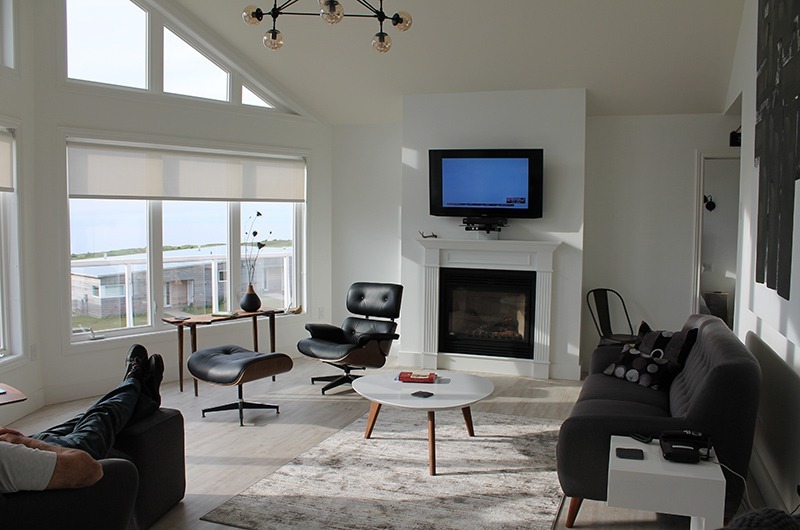 12 Mine Road Golf Chalet is a new, 4 1/2 star accommodation option for golfers/golfing groups who may be interested in visiting Cabot Links and Cabot Cliffs in Inverness, Cape Breton, Nova Scotia. The prime location borders Cabot Links. The 2,650 square foot, central air-conditioned/heated, ICF chalet was built in 2009 and has been redesigned to accommodate two golfing foursomes (separately or combined). The upper and lower levels can be rented separately, or both levels simultaneously for a group of eight. The upper level is a 3-bedroom (Q, T(XL)) vacation home with a 3-piece bathroom and a 3-piece ensuite and a full kitchen while the lower-level suite is a 2-bedroom unit with 3-piece bathroom and kitchenette. Be assured each level can be secured when the upper or lower levels are rented separately. The unique features of the chalet allow guests to meet/socialize in private areas/decks after a day of golfing on the links. The proximity of the chalet allow guests to enjoy the facilities of Cabot and the amenities of Inverness town, all within a short walking distance.